The return of the world's soon-to-be-biggest band? An ambitious double album by music's most inventive male artist? A landmark hip-hop track? In any other week, they'd be worth highlighting at the start of a post. But not when there's the debut of one of the best pop duos of the '80s to talk about instead. Responsible for my second favourite album of all time - yes, really - the pair of East London sisters burst onto the ARIA chart in 1987 with some club-influenced pop smashes. Their first track debuted this week that year and would be quickly joined on the top 50 by its chart-topping follow-up. At the top end of the chart this week in 1987, there was a major overhaul as Paul Lekakis's "Boom Boom (Let's Go Back To My Room)" ascended to number 1 and another four tracks pushed their way into the top 10. It's just typical. After all these years of having to write about their singles, the one song by The Angels I don't mind wasn't a hit. Since it was the fourth release from the already successful Howling, it's not that surprising. Given their experience in 1984-85, Bananarama should've known better than to release a moody ballad and expect it to do well. It's a shame because "A Trick Of The Night" is one of their best singles - and even came with a SAW remix. "Infected" had reached the top 30, but there was no such love for this follow-up, which features a pre-fame Neneh Cherry on backing vocals and in the music video. The Rads' fifth album, Nasty Habits In Nice Children, reached its peak of number 68 this week, while this subdued single from it would prove to be the band's final visit to the top 100. As "Walk Like An Egyptian" fell out of the top 10, The Bangles gained some momentum with this similarly ambulatory-themed follow-up. Alas, the girl band was going to end up walking around in circles as "Walking Down Your Street" spent the next seven weeks dawdling between numbers 56 and 62. Like all the flop singles by The Bangles - and they had way too many in Australia - "Walking Down Your Street" deserved much better. Guess everyone was too busy buying Different Light, which would climb to its peak position of number 2 on the albums chart the following week. A fifth single from the album was released in Europe, but it doesn't look like "Following" came out locally. The Bangles had provided guest vocals on her eighth consecutive top 20 hit, "Change Of Heart", but like them, Cyndi Lauper was facing difficulty with her latest single - another remake of a song originally performed by a man. A cover version of Marvin Gaye's landmark socially conscious anthem from 1971, "What's Going On" not only became Cyndi's first release to miss the ARIA top 20, but it peaked outside the top 50. It did, however, improve on the peak of Marvin's original, which had only reached number 69 locally despite being a massive number 2 hit in the US. They had one of the songs of the summer with "Everybody Have Fun Tonight" and the duo version of Wang Chung returned this week with another outrageously catchy pop song in the form of "Let's Go". With vocal duties once again shared by Jack Hues and Nick Feldman, the song became their second consecutive top 10 hit in the US, but just missed doing the same here. This would be the last time we'd see Wang Chung in the top 100. Australia really was slow off the mark sometimes in the '80s, never more so than with the debut single by sisters Mel and Kim Appleby. Released at the start of September 1986 in the UK, "Showing Out (Get Fresh At The Weekend)" had also taken its time to reach its peak there, finally getting to number 3 in late November. 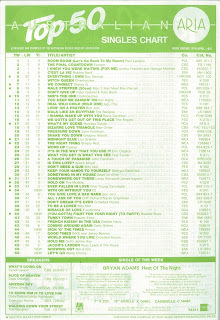 In Australia, the song had been bubbling under the top 100 for weeks since early 1987 before finally making its top 50 debut. Even then, it would only reach number 27 before starting to drop back down the chart. Spurred back on by the success of follow-up "Respectable", "Showing Out..." would rally and spend eight weeks inside the top 20, winding up as the year's biggest single not to reach the top 10. As for the song itself, it was the latest hit from songwriting and production trio Stock Aitken Waterman. But where "Showing Out..." differed from "You Spin Me Round (Like A Record)" and "Venus" was that Mel & Kim were a brand new act rather than established performers coming to the Hit Factory. And unlike Princess or any number of other acts SAW had worked with up until this point, Mel & Kim became true stars. Thanks to a combination of their cheeky personalities, which were encapsulated in the lyrics and spirit of "Showing Out...", as well as their super stylish image (all those hats!) and dance moves, the sisters became instant role models to teenage girls everywhere who sang into their hairbrushes and made up routines with their friends. Although another song, "System", had been intended as the duo's debut single, it was soon relegated to B-side status in favour of the edgier Chicago house-influenced "Showing Out..." - just one of many occasions when SAW proved they could take a club trend and turn it into pop gold. As mentioned, "Respectable" would play a big part in the success of "Showing Out..." in Australia and we'll see that debut in June. We'll pick up the Mel & Kim story then, but anyone interested in some extra credit can check out this recent interview with Mike Stock about the girls. Few artists were as prolific as Prince in the '80s - or, in fact, ever - and to prove the point he released a double album of new material at the end of March 1987. Originally intended as a triple album, Sign O' The Times became his most acclaimed release yet, while its politically charged title track was lauded as one of the best songs of the year. With its minimal arrangement and lyrics touching upon some of the biggest social issues of the era, "Sign O' The Times" was a departure from the music fans had come to expect from Prince. Possibly as a result, it and the accompanying album were only modestly successful in Australia. Next up, another (eventually) highly influential act with their breakthrough hit. Problem was: "(You Gotta) Fight For Your Right (To Party!)" was intended as a parody of partying frat boys, but most people didn't get the joke, especially the hip-hop trio's growing audience, which was largely comprised of... partying frat boys, who were attracted by the song's fusion of rock and rap. The debaucherous, MTV-ready music video also did nothing to help Beastie Boys establish their hip-hop cred, and although the song raced into the US top 10 and Licence To Ill became the first rap number 1 on the Billboard chart, they quickly disowned it. It would be another 11 years before Beastie Boys returned to the ARIA top 50, by which time their status as inventive and inspirational artists was firmly established. 1987 really was a changing of the guard in the world's biggest band stakes with first Bon Jovi and now U2 stepping into the void left by The Police and Dire Straits. Unlike Bon Jovi, the Irish four-piece already had some runs on the board thanks to 1984's top 5 hit, "Pride (In The Name Of Love)", and their star-making slot during Live Aid. But, to continue the metaphor, Bono and pals went supernova with the release of their fifth studio album, The Joshua Tree. Next week: the return of one of the biggest bands of the '70s, plus a chart-topping song from an animated film and the debut single by a pair of backing singers from the biggest pop duo of the decade. 2 of the top ten songs undeniably were blatantly gay, yet surprisingly both boom boom & male stripper were catchy & could still dance to them. You could throw in Everything I own as well I suppose. Yes! 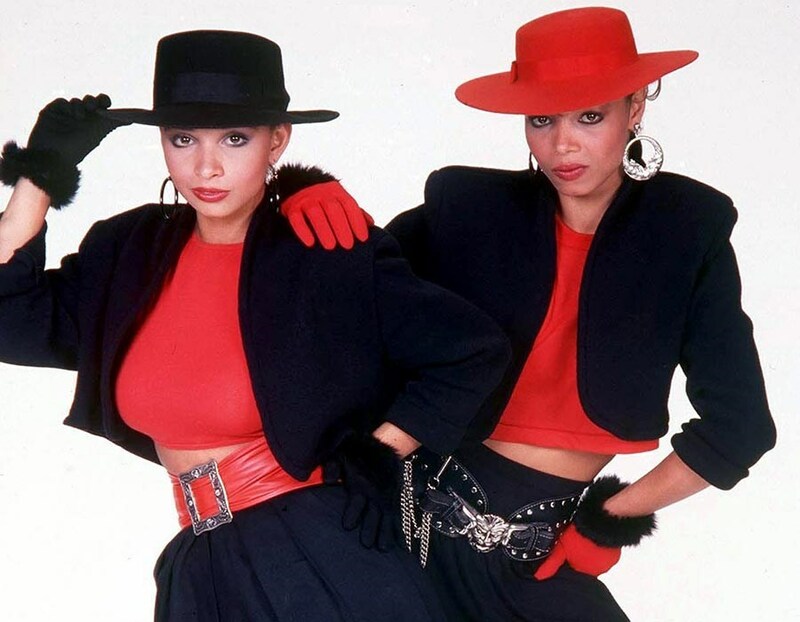 Showing out & Respectable are my favourites by Mel & Kim, who could not forget their hats & irresistible charms, they were so cute! I really like sign o the times. Sounded really different from previous Prince material but that funk beat throughout the song is awesome. Don't mind you gotta fight for your right, but I prefer No Sleep til Brooklyn. With or without you was a pleasant enough song but not my favourite by U2. Quite a mammoth week for debuts. Not really following music (or charts) yet, I never heard 'A Trick of the Night' at the time, but my local K-Mart (which seemed to over-order in flops) still had the 12" of it on the shelf in early 1988. Was the SAW version promoted here as the single, do you know? I first heard 'Slow Train to Dawn' on the radio in early '96 and thought it was a new song. Liking the Bangles but not yet owning the album, I only heard a snippet of 'Walking...' during the 'Different Light' TV ad showing around this time. 'Following' wasn't released here. I didn't know the Cyndi Lauper track at the time, and it seems a strange choice for a single - an artist of her then-stature resorting to releasing a cover of a well-known song. I think I heard 'Respectable' before 'Showing Out' (which was released here back in December '86), and wasn't aware of 'Showing Out' until listening to my sister's '87 Right On Track cassette on my first Walkman. While 'Respectable' is poppier and naturally the bigger hit, I think I like 'Showing Out' slightly more. But both were among the best pop singles of '87 (in Australia, anyway). I wasn't aware of 'Sign "☮" the Times' at the time, and while it's OK, tend to think it's a bit over-rated... but I like that they were going to call the baby Nate (if it's a boy). '(You Gotta) Fight for Your Right (To Party!)' is the Shania song title that never was. It must be one of the only, if not the only, single to grace our charts with double brackets. It's surprising it was their only real (minor) hit here until 1998. I'm not overly fond of U2 on the whole, but 'With or Without You' was quite decent. This was the week that Rage premiered on ABC, so I guess this was the first Top 50 they broadcast? Gotta love that lime green chart though. Did rage play the top 50 from the outset? I noticed it was one thing they didn't mention in the documentary the other night. I don't think rage started airing the top 50 until January 1988 - at least, that's what I've read somewhere (I didn't cotton on to it until a few months later). Back in 2015, when rage brought the chart back in the form of a top 20 segment, they aired the top 20 from the week rage started during their Saturday morning Vault segment. 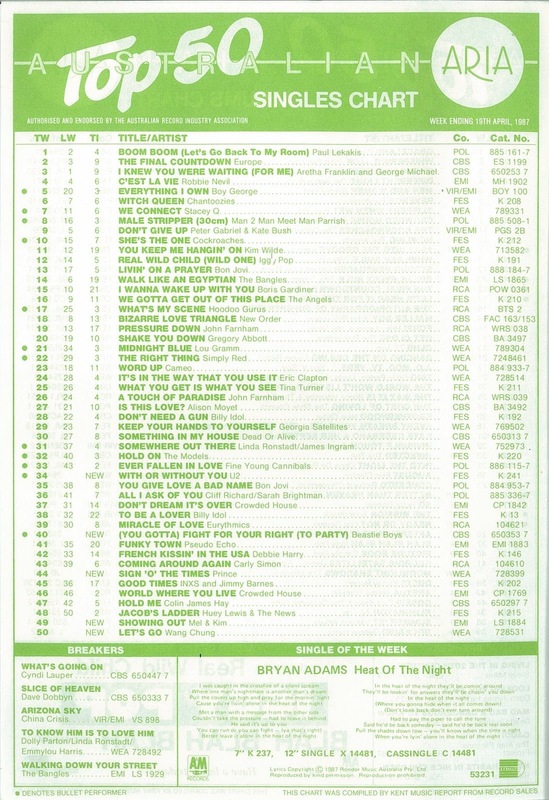 However, it was the top 20 corresponding with the week ending 12th April 1987 chart that they aired. Makes me wonder if the ABC still have a stash of printed ARIA charts.